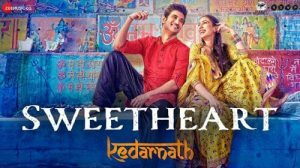 Sweetheart Lyrics – Kedarnath: Presenting this new song from the movie Kedarnath. The song is sung by Dev Negi and the music has been composed by Amit Trivedi. The song has been written by Amitabh Bhattacharya. This is the second song from the movie Kedarnath which is releasing on 7th December 2018 and is a Hindi-language romantic drama film written, directed and co-produced by Abhishek Kapoor. Kedarnath movie is a Hindu-Muslim love story, which portrays how a Muslim pithoo saves a Hindu tourist from the Uttrakhand floods at the pilgrimage, and the love that eventually develops between them.